Frank sitting one more time on his bus! Many people spend less than four years at a job. Not Frank Jensen. 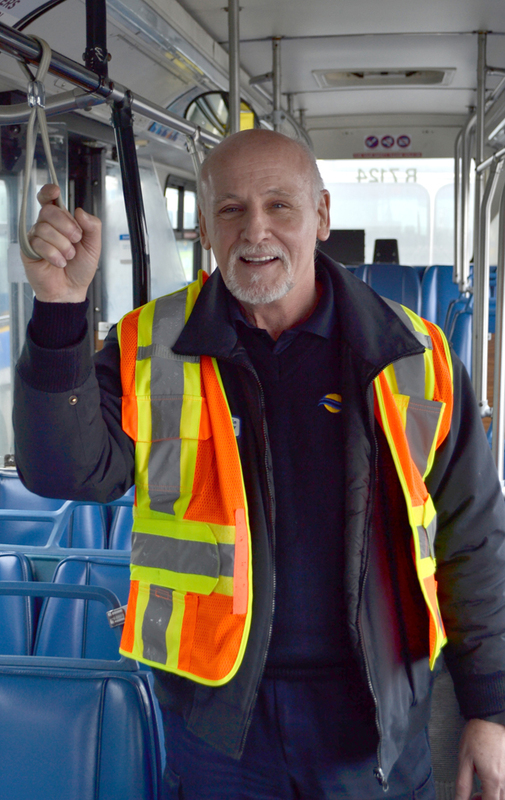 Yesterday, Frank took his last trip after 41 years of exemplary service as a bus operator! It’s not everyday that someone retires after more than four decades at the same job. And last night, Frank’s accomplishments were featured on the CBC Evening News. As you’ll see from video, Frank will be missed by more than just his fellow employees. I had the privilege of sitting down with Frank and his son and daughter after Frank’s last run on the #405. Take a listen to what Frank and his family had to say. 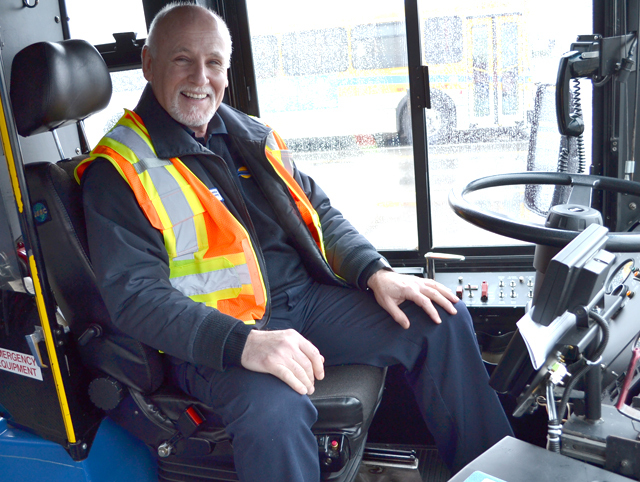 After I spoke to Frank, his fellow operators and other staff at the Richmond Transit Centre lined up to congratulate him on his accomplishment. Thanks for all the great years, Frank! You’ll be missed! Congratulation Frank! 41 years were not easy and must have seen all sorts of riders. If Frank has a chance to see this comment, I would like him to comment on the following. A normal weekday at 7:30pm, in Vancouver. A person got on a bus and put some coins in the machine, it displayed 0.85. Driver said not enough, and the person replied that a Toonie was inserted. Then driver replied saying “Don’t worry, sometimes the machine didn’t count.” End.